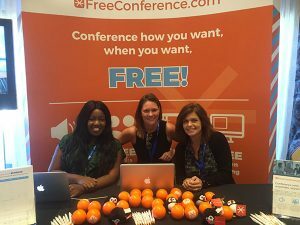 FreeConference.com Team to Attend Catalyst Atlanta 2016! Catalyst is a yearly convention which is taking place on October 5th through 7th in at the Infinite Energy Arena in Atlanta, Georgia. It boasts a host of speakers, labs, and leadership events that are designed to create the next generation of church leaders, and are sure to excite your ambition. According to their website, “It’s common in our culture to sort, divide, and exclude: to look out for ourselves, make it at all costs, and leave others in our wake. But Jesus is building something uncommon. It’s time for a family meeting”. Finally, to anyone who might be attending #CatalystATL, feel free to pop into booth #57 on October 6th and 7th when you have the time, because we are sure to have some cool freebies for you! Just listen for the *TICK* *TICK* sound of our amazing spinning prize wheel, and make sure to bring your A game! Did I mention that Puffin will be there?